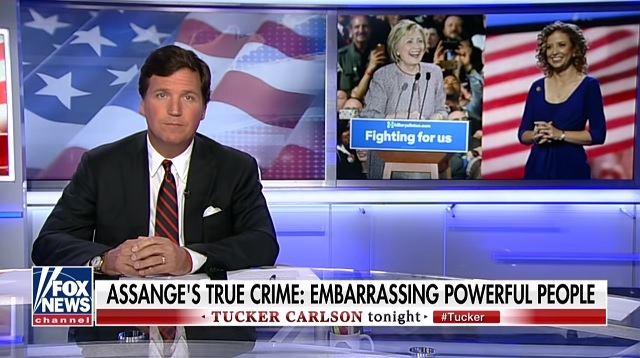 Fox News host Tucker Carlson said Thursday night that Julian Assange's real crime was embarrassing the powerful in Washington, DC. "Julian Assange embarrassed virtually everyone in power in Washington," Tucker Carlson said. "He published documents that undermined the official story on the Iraq war and Afghanistan. He got Debbie Wasserman Schultz fired from the DNC. He humiliated Hillary Clinton by showing that the Democratic primaries were in fact rigged." "Pretty much everyone in Washington has reason to hate Julian Assange," Carlson said. "Rather than just admit that straightforwardly he made us look like buffoons so now we're sending him to prison!"